In order to encourage the purchase and use of electric vehicles and favor the new National Decarbonization Plan, on February 27, 2019, Costa Rica’s Environment Minister announced that the government will remove electric vehicles from vehicular restrictions during peak hours and promote preferential parking spaces in public areas. Additionally, the government is now producing green license plates for electric vehicles in order to differentiate them from the rest of those in circulation. Previously, in 2017, the Costa Rica Legislative Assembly approved the New Law No. 33096, to encourage the use of hybrid-electric vehicles as part of the use of clean technologies. The new law was intended to exempt 100% electric vehicles from sales taxes, import taxes, annual vehicle taxes (marchamo), the payment of parking meters, and vehicular restrictions. The law stipulates that the provisions will only apply to 100% electric vehicles and zero-emission technologies that do not contain combustion engines, including; automobiles, trucks, buses, trains, motorcycles, and bicycles. The taxes that will be exempted or reduced are the sales tax, the customs value tax, and the selective consumption tax. A percentage is deducted for the first $60,000 of the vehicle’s CIF (Cost, Insurance, Freight) value. Out of these, $30,000.00 are 100% exempted from tax. The discounts on amounts over $30,000.00 are applied according to the table on the right. The bottom line is that the maximum savings per vehicle, regardless of its value, is $18,000, and the tax exonerations will be valid for a period of five years. The tax reform proposal was approved by the President of Costa Rica on January 25, 2018, and the new law will take effect as soon as it is published in the official legal newspaper La Gaceta. 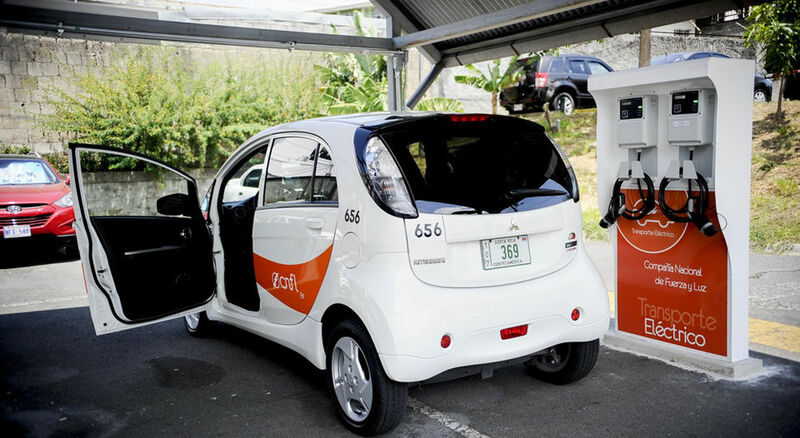 A previous stimulus plan for the purchase of electric and hybrid vehicles was approved by the Costa Rican Congress in May of 2016, with unanimous approval by all political parties. This new initiative provides tax incentives for those who purchase the specific type of electric hybrid vehicles that need to be plugged in to recharge the batteries. These new vehicles, that are exempt from certain taxes, are not inexpensive and some are already available for sale in Costa Rica. For instance; the BMW X5 Hybrid costs $98,000, and if the new plan is approved, the cost would decrease to $82,000. By September of 2016, the new BMW I3 hatchback automobile that is 100% electric is projected to cost around $55,000, and if the law passes, it will be 14% cheaper, at $47,300. Additionally, the Mitsubishi Hybrid SUV Outlander PHEV, costs $48,000 and if the new stimulus plan is approved, the price would drop to $40,000. Furthermore, in 2017, the new electric Nissan Leaf will be available for around $45,000. The distributor of BMW vehicles in Costa Rica has charging stations for its customers in their dealerships in Curridabat, Escazú and La Uruca. These recharging stations are free for the use of the owners of the new electric vehicles sold by the distributor. The National Electric Company, CNFL, has committed to participate in this new program for at least the next two years in order to stimulate the market for the new electric vehicles. During 2016, CNFL has committed to open two electric recharge stations in San Jose and Heredia that will be open to the public. The objective of this new initiative is noble, as the new vehicles will reduce fuel consumption and expenditures on petroleum products that cause pollution and negative effects on public health. However, these new vehicles are pricey and they have a limited range of only 150 km. The writer, Tom Rosenberger has lived and worked in Costa Rica since 1992 and from his travels throughout the country inspecting property and construction he has acquired a wealth of knowledge about living and doing business in Costa Rica. If you have any questions and would like to contact Tom click here.